It's easy to look at the title of a book and think "that's old news" or "I already know all there is to know on that subject." But before you dismiss this publication, consider just how far the IBM® Parallel Sysplex® architecture has come. From the early days the mainframe has embraced a shared everything approach. The original designers coded IBM z/OS® (called IBM MVS™ or IBM OS/390® back then) with the functionality necessary for the operating system to create the repositories, manage the data flow, and ensure the integrity of the systems involved. From there, the middleware systems provided the exploitation and advanced functions to mature the technology. The component in the middle of all this great technology can easily be taken for granted. That is the IBM Coupling Facility. 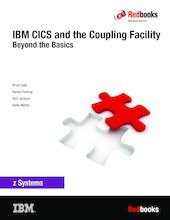 This IBM Redbooks® publication discusses both traditional uses for the IBM Coupling Facility technology and new ways to use it with products such as IBM CICS®. You can learn how to perform new functions and have these functions benefit from the scalability and availability achieved only in a mainframe ecosystem. Open standards are a large part of considerations today, as most companies run IT shops with a mix of technology components. As the world embraces these technologies, it is necessary to understand how to mix the world of mainframe architectures and products with other open architectures. This mix allows the best tool to be used to solve processing needs, at the right cost and service levels. Often the functions needed for modern processing can be found in house, in places where staff are skilled and that already deliver the robust production environments you count on daily. This book discusses these modern functions and how to achieve them with CICS use of the IBM Coupling Facility. You will learn how one IBM client, Walmart, took these concepts far beyond the original design as they share their experiences and even share code examples to help you get started. The last chapter of this book shows what can be achieved when a combination of old and new functions are use together. Even if you have familiarity with what could be done with the IBM Coupling Facility in the past, there is much to learn and deploy in a modern world.